A 2016 KPMG study showed 96% of organisations are in some phase of transformation. Enterprise agility is seen as a necessary capability enabling organisations to succeed with change and adapt in a constant changing business environment. 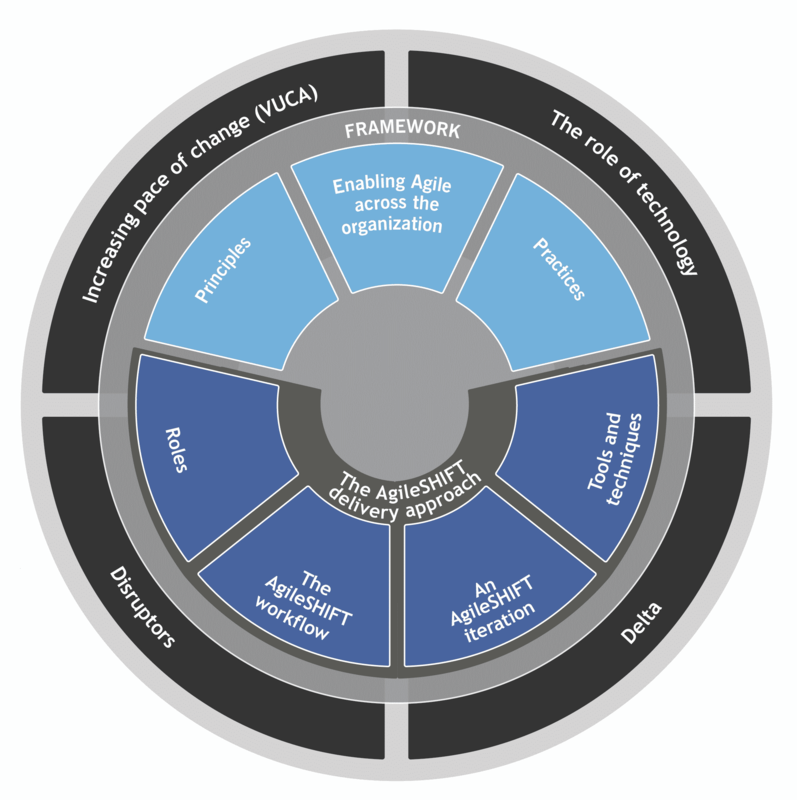 AgileSHIFT is a light-weight framework designed to fully align all relevant people in an organisation to understand and embrace the need for change. It provides agile principles and practices that everyone can use and supports the development of an agile mindset underlined by a culture of agility. AgileSHIFT’s contribution to cultural agility helps remove institutional and behavioural barriers that inhibit successful change, improves adaptability and faster response times. Vital capabilities for organisations operating in a market place characterised by increasing customer demands and disruptors actively shaking up the established players. Where agile approaches such as agile Scrum, AgilePM, SAFe and Kanban predominantly focus at the product delivery level, AgileSHIFT is seen as the very first agile framework of its type that focuses on organisational agility underpinned by a culture of agility. The AgileSHIFT framework is made up of five principles and five practices everyone within an organization can adapt and adopt. It outlines a delivery method comprising roles, competencies, workflows, tools and techniques. Enhancing enterprise agility by aligning front-line business functions with development teams that may already be actively applying agile ways of working. Enabling collaboration, innovation, greater productivity, flexibility and adaptability. The premise of AgileSHIFT is that an organization exists to serve and satisfy its customers (and other stakeholders) in the co-creation of value. An Essentials level exam can be completed that encompasses the 3 learning modules referenced above. Total exam duration is 45 minutes, and can be split into 15 minute blocks for each learning outcome. There are 33 questions in total worth 1 mark each. The pass mark is 20 or above (approx. 60%). AgileSHIFT training is designed for those directly affected by a proposed change and those who can influence change success. Download our AgileSHIFT brochure for more information and contact us to speak to a HiLogic Agile Transformation Consultant.